The Retirement of Michael Jordan reports on the first time Jordan steps down from the Chicago Bulls. home » Sports » The Retirement of Michael Jordan reports on the first time Jordan steps down from the Chicago Bulls. Michael Jordan is tired of being Michael Jordan. Sports version of Elvis Presley has decided to hand in his celebrity card at the expense of the game he loves. A game that has loved him back, like few games have loved an athlete before. It is impossible to believe anybody could have that kind of love affair with a sport again. For the last three years basketball’s premier attraction has played no less than 120 games a season, won three titles, and captured his second gold medal, which has apparently capped a career that will leave no doubt who was the greatest talent to grace a professional basketball court. But it was never the game that pushed Michael Jordan around the way the glow of his star has, and in the last few years the backlash of fame has pushed him as far as he will go. Gambling allegations, celebrity golf tournaments, endless endorsements, and finally, the brutal murder of his father this past summer, has pushed the world’s most recognizable personality to retire in his prime. Since the day he held a basketball in his hand, Michael Jordan has been pushing back. Every challenge has been conquered with that ball in his hand. When the ball was absent, life, was not so simple. No human being could be that proficient at anything else, have that much control in the outcome of events. Michael Jordan was as close to perfection as any athlete gets between the lines, but real life problems are not the final seconds of a fourth quarter when Jordan would clear the floor, ignore everyone in the jam-packed building, and take charge. Michael Jordan didn’t become the icon that he is today until well into his pro career as a member of the Chicago Bulls, a mediocre franchise in a league that had been on it last legs until he, Larry Bird, and Magic Johnson saved it. As a freshman, he was never the focal point of North Carolina’s 1982 national championship team. Dean Smith was known for coaching teams, not players; and even though it was young Jordan’s jump shot that sealed the win in the final seconds of the final game of the season, his stock seemingly failed to rise when two years later the Houston Rockets and Portland Trailblazers passed him up in the NBA draft. 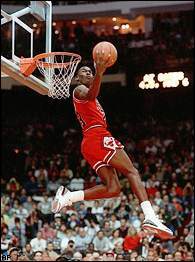 Jordan won the Rookie of the Year award just the same, turning the act of dunking a basketball into a work of art. How he soared above the crowded lane of giants, disseminating logic of physics, while sliding the ball through the cylinder as if it were an afterthought to his midair ballet. But those beatific moments paled in comparison to the way he developed into the ultimate compete player. Jordan was a scoring machine, bleeding you with jumper after jumper, only to blow by you off the dribble. Then, when you had the rock, he was as tenacious a defender as the game had ever witnessed. Like Ruth, and the century’s most influential athlete, Muhammed Ali, he transcended not only his sport, but the world of sports itself. But unlike those guys, Jordan calls it quits before the legend outlives the body. In fact, except for Rocky Marciano and Jim Brown, both of whom exited their sport at the pinnacle of excellence, nobody had ever walked away so soon, so good. But Marciano, undefeated in 49 professional bouts, chose to feed off every minute of his celebrity until his untimely death, and Brown, football’s version of Superman, took the first plane to Hollywood and hung his star on the silver screen. Michael Jordan says he doesn’t want to make movies, or become America’s guest, or sit in a TV booth and stumble through inane analysis of a game he played as if he was imbued with divinity. No, His Airness is trading in his crown for a golf club and an afternoon with his family. He’s trading in his million-dollar smile for a five-cent laugh with friends. He walks away, for now. Will he return? I think it’s not as certain as his 15-foot fade away jump shot, but for today, the man will stop being everyone’s expectations of Michael Jordan. He’ll try to find that enthusiastic kid who wanted to take his God-given talent and make a run at a dream. Then, and only then, will Michael Jordan be back. For now, he’ll be someone else.